If I had to make this again I would use the recommended amount of spinach I had to compromise with this recipe because I had only half the spinach and it need the full amount and I have to say next time I would simmer the pumpkin with the tomato and merely layer the mushrooms without cooking them as they will cook in the oven. Preheat the oven to 200°C/400°F and lightly grease a baking dish with olive oil. Sauté the onion in the olive for five minutes, stirring regularly add the garlic and cook for a minute. Add the tomatoes and crush lightly with the back of a wooden spoon, stock, nutmeg, salt, pepper and sage and simmer for ten minutes. Steam the pumpkin for five minutes until al dente soft. 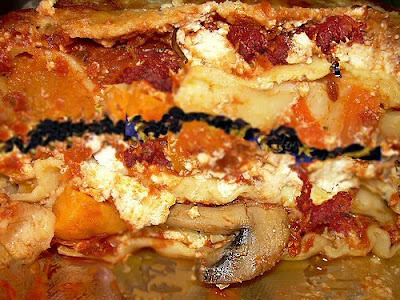 Place a small ladle of sauce on the bottom of the baking dish and cover with a layer of lasagne sheets and cover with some of the tomato sauce, and a little of the pumpkin and mushrooms and then a layer of spinach, repeat the layers and then add the walnuts ion top. Cover with parmesan cheese to taste and bake for about thirty minutes until the cheese is golden and bubbly.